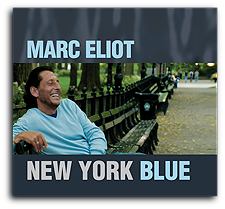 "One Of The Good Guys"
marc eliot: "New York Blue"
When I was very young my dad introduced me to the American Songbook melodies. We used to play 'Name that Tune', and he always won. I've been humming and singing those songs ever since. My young musical taste never wandered far from the standards, and this collection is a reflection of that. Music has always been such a significant and fulfilling part of my life, revealing so much of who I am and what I care about. To be able to become a part of the melody and lyrics and float through the song is all that I am and what I want to share with my audience. Also included in this compilation are a couple of songs that I wrote myself, Diamond in the Rough and New York Blue. I think they fit just fine, and I hope you do too. There is so much wonderful material to choose from. Standards can mean many things to many people, evoking memories and relationships and passages. There was a great deal of time and care given to the selection of which songs I included here. Part of what appeals to me, in addition to the fabulous melodies, are the slightly old fashioned, evocative and innocent lyrics in songs like Tea for Two, I'll Take Romance, The Simple Life, and I Don't Want to Walk Without You. We may not express our feelings like that anymore, but it's nice to hear and remember these timeless sentiments. © 2000 - 2015 Marc Eliot Enterprises & ETB Productions. All Rights Reserved | eMail: info@marceliot.com | Phone: 212.920.9516 | Design & Hosting by 8thPlanet.com.